Activate this setting for the basic or Kerberos authentication. The Intrexx portal needs to operate with integrated authentication. The users from your Active Directory must be added or imported accordingly. Please make sure that at least one user is a member of the Administrators group so that you can continue to administrate the system. The server, where Intrexx is installed, requires the group rule "Delegation" in the Active Directory ("Trust this computer for delegation to any service (Kerberos only)"). All clients and servers must be members of the same domain. To provide Kerberos tickets, the Intrexx Kerberos Token Provider Service must be installed in the Internet Information Server that is used to communicate with Intrexx. Further information on this topic can be found here. If the user cannot be authenticated, the basic authentication can be activated automatically. With the Basic authentication, the username and password of a SharePoint user are requested in Intrexx and sent as the header in the HTTP request to SharePoint. This is the simplest login method and should only be used in connection with HTTPS because otherwise, credentials are transferred without being encrypted. 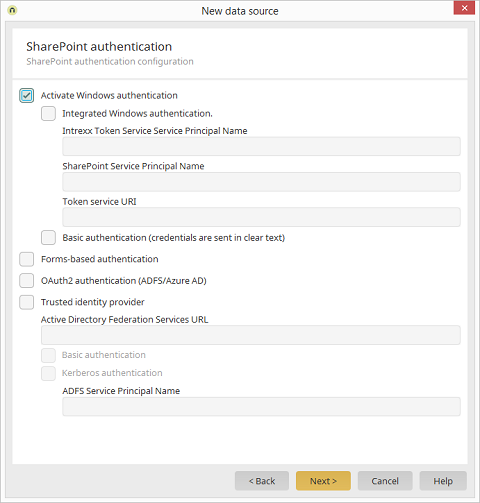 The forms-based authentication allows users to log in using a SharePoint login form. With this option, a login form will be shown in Intrexx to the user when they access the SharePoint data for the first time. Intrexx then carries out the authentication using the SharePoint Web service (or /_vti_bin/authenticate.asmx) in the background. The ADFS server must be installed and configured in SharePoint. The ADFS server has to support basic and/or Windows integrated authentication. The Intrexx Kerberos Token Service must be installed and configured for Windows integrated authentication with ADFS. Further information on this topic can be found here. The URL contains the three essential parameters "wa", "wtrealm" and "wctx". The required values for these parameters can be taken from your SharePoint ADFS configuration. Please note that the URL character string is already encoded in such a way that it conforms to URL. Intrexx sends the user login details to this URL and, if the login was successful, is redirected to the SharePoint server to complete the authentication and authorization. When using basic authentication, the username and password are sent directly to ADFS. With Kerberos, a ticket will first of all be requested for ADFS using the Intrexx Kerberos Provider Service, this ticket will then be sent to ADFS. Additionally, the Service Principal Name of the ADFS server will be needed for Kerberos. Windows integrated authentication must also be activated and the SPN of the Intrexx Kerberos Token Service must be specified. Make sure you are precise when entering the name. Intrexx ascertains the method to be used from the user attribute during runtime when accessing the SharePoint data groups for the first time. If this is not available or specified, Intrexx will search for the attribute in the user groups. If it cannot be found there either, Intrexx will proceed with the order of priority listed above. The connector must also be informed as to what the user or group attribute is called.